The term 'Corporate Wellness' is incredibly broad and can include health screening, massages, Bootcamp programs, meditation and healthy snacks in the work vending machine. Corporate Wellness programs are designed to improved the health, fitness and morale of participants. Programs could be a 12 week challenge or might involve fun days that might involve learning circus skills, cooking workshops or a Big Day Out with silly and fun competitive challenges. There is not much difference between a Corporate Wellness day or a Team Building day. In fact they might be considered the same thing. Team building sessions and programs are designed to improve the interpersonal relationships and communication skills of participants. Better relationships and increased communication leads to higher levels of productivity. As team building sessions are designed to be fun, engaging and memorable there is an added benefit of enjoyment, improved morale and an enhanced work environment. Staff feel rewarded, valued and a sense of belonging. 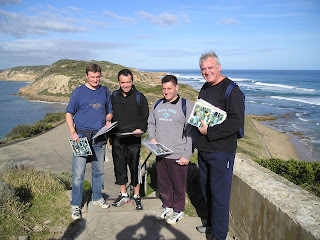 One of our most popular team building sessions is conducted in the Point Nepean National park. It involves teams collaborating to solve a complex puzzle. Whilst improving communication is a key focus, the group are required to walk in a spectacular location, spend time with their colleagues and enjoy healthy snacks. The session could easily be considered as Corporate Wellness as it involves exercise, fresh air, enjoyment and teamwork. Corporate Wellness Days and Team Building days should result in a happier, healthier and more engaged workforce that feel rewarded with a sense of community and belonging. Is there a difference, I don't think so. I totally agreed with that. Team building activities and events do have a great effect on the relationship and connections with corporations or any company size. I've been in many team building events and it was always one of the best events in my working life. And thanks to our team building event organizer for making it always the best.